The creation of this pie is due to my sister-in-law introducing me to Tazo Chai concentrate. Mix a little concentrate with some milk and you have your own Chai drink. Put it in the freezer for a little bit, and you have a frozen Chai drink. The possibilities are endless. 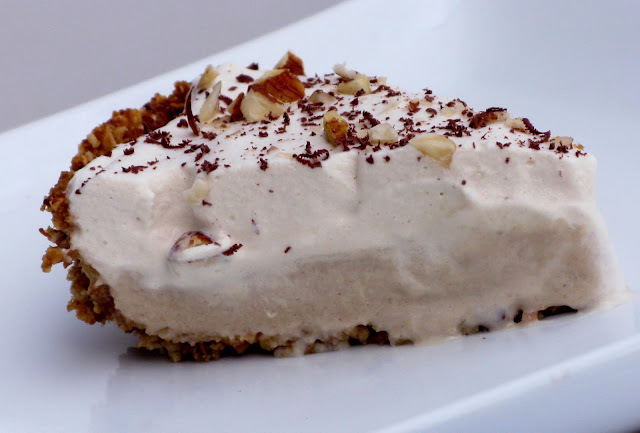 I decided that the Chai would work great in a cream pie, and immediately thought to make a pie with my cinnamon vanilla pudding, and Chai whipped cream. 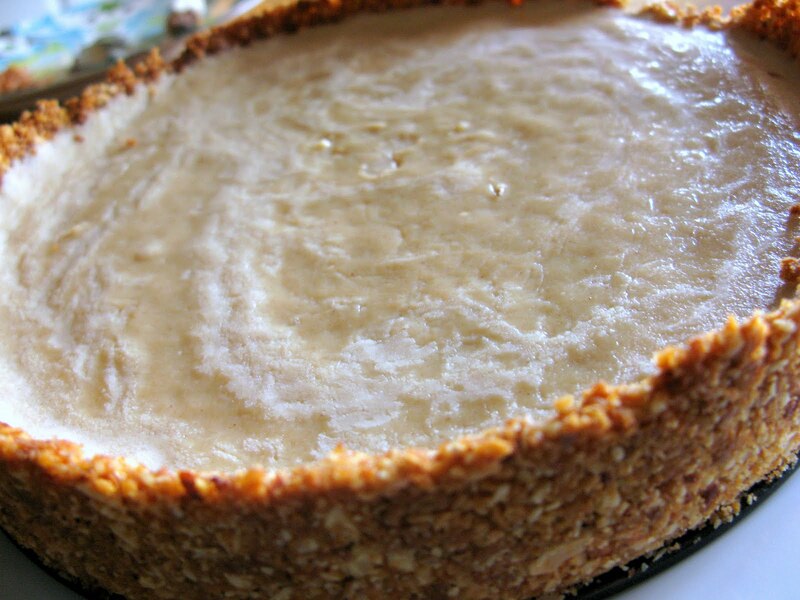 To put it over the edge, I put it all in a hazelnut-almond crust. Most cooks have their share of recipes not turning out like planned, and accidents turning into pleasant surprises. This pie turned out to be my disaster-turned-delicious. What was the problem? My pudding would not set up. I have made it numerous times before, and never had any trouble, but of course the one day it would go wrong would be when trying a new recipe. After being in the fridge for a couple of hours and still looking pathetically like a cinnamon soup, I decided to throw it in the freezer to see what happened. As it turns out, frozen pudding is quite good. 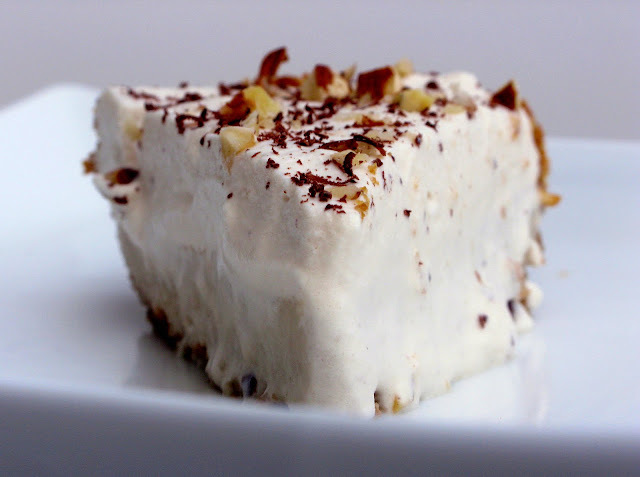 So I went with it - topped it with the Chai whipped cream - and sprinkled with chopped hazelnuts and shaved chocolate. It was good! Heat oven to 350F. Place nuts on a baking sheet and toast for about 10 minutes. Remove from oven and allow to cool. Once you are able to handle them, remove the skins from the hazelnuts. Finely chop the hazelnuts and almonds. Place the graham crackers in a resealable bag, and crush into fine crumbs. In a medium bowl, mix the graham cracker crumbs, chopped nuts, brown sugar, and melted butter until well combined. Press the mixture firmly into the bottom and sides of a spring-form pan. Bake at 350F for 12 minutes, or until golden. Remove from oven and let cool. In a heavy bottom medium saucepan, mix the cornstarch and brown sugar. Gradually add the milk and cook over medium heat until bubbly, stirring constantly. Cook and stir for 2 more minutes and remove from heat. Add the cinnamon and stir. Gradually add one cup of the milk mixture to the beaten eggs. Pour the egg mixture into the milk mixture in the saucepan. Cook the pudding until almost bubbly, but don't allow to boil. Reduce heat and cook for 2 more minutes, then remove from heat. Add the butter and vanilla, and stir. Pour the pudding into the pie crust, and place in the freezer for a couple of hours, until frozen through. Place the cream, chai concentrate, mixer bowl, and whisk in the freezer. Allow to chill for about 10 minutes. Pour the heavy cream into the cold mixer bowl, add the Chai concentrate, and mix on high speed until cream is whipped into soft peaks. Spread the whipped cream over the layer of pudding. Sprinkle with toasted hazelnuts and shaved chocolate. Serve and enjoy! This pie is so creative and delicious sounding. 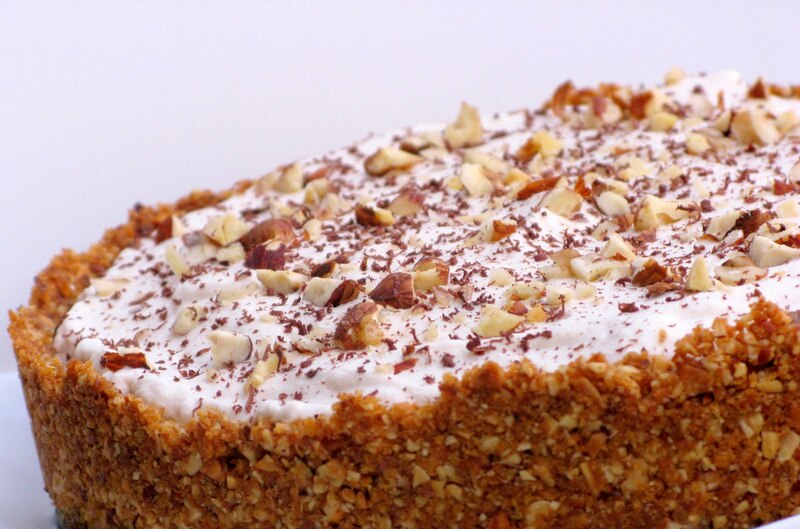 I love the nutty crust and the chai flavored whipped cream. Wonderful flavors! I will have to look for that concentrate! I love chai...but have never baked a pie with it! How creative, and delicious :) I'd say your troubles definitely worked out for the best in the end. Frozen sounds perfect to me! I saw this on Tasty Kitchen and got a little light headed. It look beautiful and has 2 of my favorite things chai and hazelnut....Mmmmm! Hi, I am making this pie today for a party tomorrow. I have read over the instructions several times and I am not sure if the whipped cream part can be frozen or if the pudding part can be thawed. I need to have this pie all put together in advance and ready to serve. Is that possible? I also LOOOVE Tazo chai and first saw this picture on pinterest! It led me to find a recipe for such a creation and voila! Here you are! I can't wait to try it!! Thank you for the recipe & how-to! !